Montreal Standard's "Canada's Aid to the Allies and Peace Memorial"
"Canada's Aid to the Allies"
“Canada's Aid to the Allies and Peace Memorial” (ed. Frederic Yorston, Montreal Standard Publishing Company) is a 152 page post-WWI publication focusing on what the various provinces, people, and companies had done to help the Allied cause during World War I. Published in Montreal shortly after the end of World War I in a large magazine-style format (19.5" x 23.5"), the majority of ads are for companies in the Montreal area with a sprinkling of major industries from coast to coast. Image courtesy of: Library and Archives Canada, Amicus no.11256183, Canada's aid to the Allies and peace memorial, The Standard, Montreal. 1919. Front cover, ecopy number e010900662-v8, edited. The Quebec Family History Society (QFHS) has in their possession a somewhat damaged copy of this amazing document. It had been unidentified, rolled up in a cabinet. The binding is broken in places and pages are ripped and fragile. Kindly, the QFHS has given me permission to use the document. 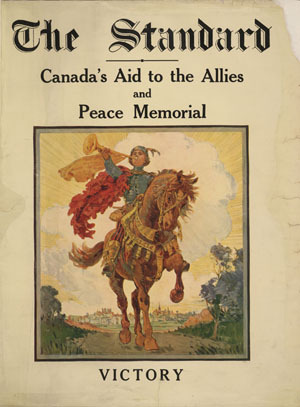 The actual document "Canada's Aid to the Allies and Peace Memorial" has no page numbers. Some of the two-page spreads are intended to be removed and displayed as posters. The loose sections and pages in the possession the QFHS have been arranged following the order of pages in the copy held by Library and Archives Canada. For the sake of clarity and organization, I have assigned a number to each page. Contents of "Canada's Aid to the Allies"
Ad: Montreal Light, Heat and Power Cons. Full page: Roll of Honor – Lake of the Woods Milling Co.
What P.E.I. Has done to help win the war. Roll of Honor: Canadian Tube and Iron Co. Roll of Honor: Almy’s Ltd. Roll of Honor – The Steel Co. of Canada Ltd. The Jaeger Company – includes Montreal and H.O. Roll of Honor – Munitions and Metal Products Ltd. Text re J.C. Lamothe, Esq., K.C. Roll of Honor – Royal Trust Co. Portrait: Lieut.-Col. Clarence F. Smith – Can. Patriotic Fund, Mtl. Image: Peter Berkovitch, K.C., M.P.P. Text: A Successful Independent Fire Insurance Co. Roll of Honor - Kaufman Rubber Co.
Eastern Car Co., New Glasgow, NS. F.A. Skelton, Canada Car and Foundry Co.
Bottom Notice: The Standard’s “Canada’s Aid to the Allies and Peace Memorial” also by cooperation of Federated Press Ltd., Montreal. Roll of Honor – Lyman Tube and Supply Co. Roll of Honor – Matthews-Blackwell Ltd. Text: Story of the Empire Coal Co.
Montreal Coal and Dock Co.
Yorston, President and Managing Editor; A. Paterson, Secretary-Treasurer.